If you have ever wanted to try your hand (thumbs, to be more specific) at a floatplane, then this 1/2A size Aeronca Champion is just the ticket. Although designed by Walt Mooney as a free flight ROW (rise-off-water) model that easily converts between wheels and floats, modifications to 3 or 4 channel radio control would be a snap, especially since the plans show separate construction for the control surfaces along the hinge line. With about a 46" wingspan and lightweight but strong construction, this model could easily have been designed with modern electric power and micro R/C in mind (you can scale the plans to whatever size you prefer). 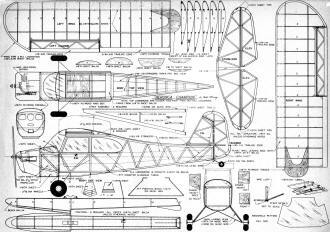 When I saw the photo of the 2-section wing with a plywood center joiner and removable floats, wheels and struts, it reminded me of an RTF type airplane, but of course you must build this Champion yourself. Take-offs from the water are snappy and landings are beautiful to behold. Let's get going! On land or sea this flying scale model for .049 power is as real as real can be. Hundreds of successful hops. Why make the Champion? 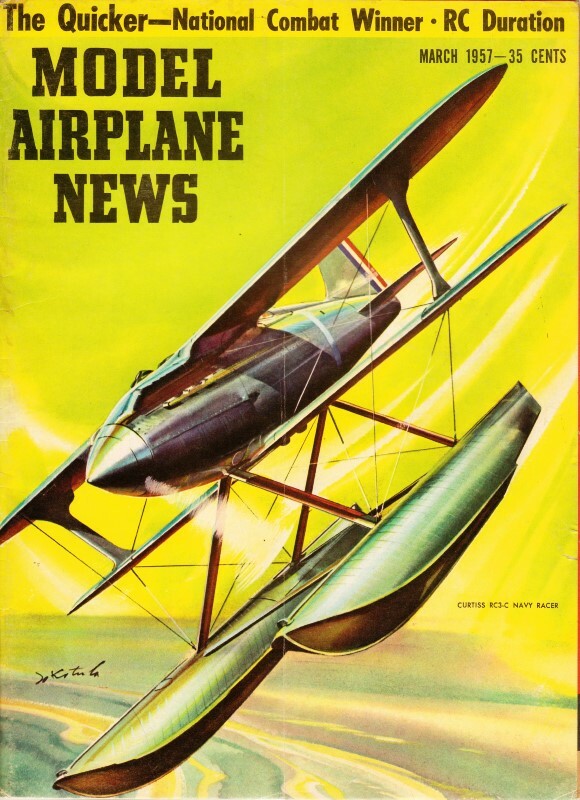 To come right to the point, the following reasons explain why the Aeronca Champion makes a perfect flying scale model. The full-sized airplane is very easy to fly and, I guess, every pilot likes to build a model of a plane that he has flown. The "Airnocker" is common enough so that details are easy to study first hand. It is fabric covered so that true scale appearance with a light flying weight is easily obtainable. It has the right aerodynamic setup to make a fine flying-scale model. That characteristic orange-bellied color scheme is impossible to mistake for a Cub. Convinced? The original model shown in the photographs is over two years old. It has been flown in two contests, taking second in a field of 16 in San Diego, and seventh at the last California Nationals. It has also been flown as a sport ship several hundred times with and without floats. On wheels, it glides flat and climbs steeply, typical flight times being 2:33 on a :35 engine run and 3:30 on a :49 engine run. With floats, take-offs are snappy and the landings are real pretty. Water take-offs work best in calm weather and with maximum power. The model is exact scale with two exceptions: these are increased dihedral and a slightly enlarged horizontal tail. People familiar with the free-blown bulgy windshield on some of the real Champions will complain about the one on the model, but the windshield shown is scale for some Champions (not all of them had the real bulgy windshield) and is much easier to model. The floats are definitely not scale floats but they are semi-scale and have the right relative size. They were designed to work well on a model. Don't forget to fasten the safety belt. Increased dihedral, slightly enlarged horizontal tail are the only departures from scale. 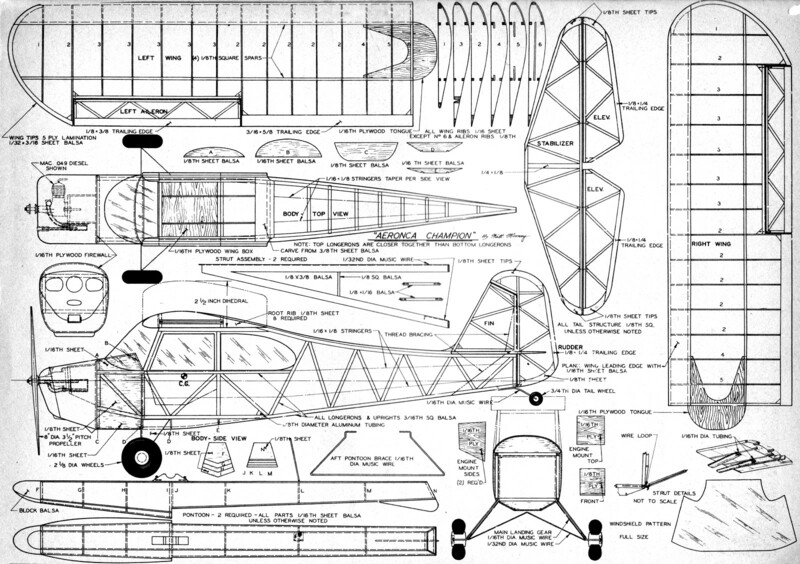 The wings of the Aeronca Champion model have the scale number of ribs and, in general, scale structure. They are relatively straight forward as far as construction goes. Care must be taken when cutting out the slots in the three inboard ribs for the plywood wing tongues, in order to give exactly the same incidence angle in each wing. The wing tips are laminated from five plys of 1/32 x 3/16 balsa. A form block is cut from boxwood scrap to the inside contour of the tip, then the balsa plies are coated with cement and formed around the block. When dry, this gives a very strong tip bow which is nearer to scale construction than the common flat sheet-balsa tip. Remember to wax the form block so you can remove the tip bows when dry. The tail surfaces require no explanation hut don't omit the little triangular gussets shown. They prevent the corner wrinkles which appear so often on covering and doping flat tail surfaces. The fuselage is basically a straight forward box. The two sides are built up, one above the other, in the interests of similarity, on the plans. The left and right side can be exactly alike unless you want to make a working door. The door is on the right side of the fuselage only and is indicated by the phantom (- .. -) line. If you intend to make a door, fill in the right hand frame with 3/16 sheet back to the front of the back window; 3/16 square balsa is used for all the basic structure. After all the cross braces are in, build up the wing center section. Eight center-section root ribs are required from 1/8 sheet. Four are laminated together for each side. The forward ends are rounded off as shown in the top view to form the windshield outline. Carve a trailing edge section and cement it to the fuselage frame, then add the root ribs. The wing box is made from 1/16 plywood. It should be a good fit in the slots in the root ribs. The center section is probably the most difficult part of the model but studying the plans and a little patience make it not too hard. After the center section is on, cut out and cement the formers in place. Next, add the planking aft of the firewall to the front of the landing gear. The side planking of 1/8 sheet must be carved after installation to the contour shown in the fuselage section looking forward. Now add the 1/16 by 1/8 hard-balsa stringers. Floats and land gear are quickly interchangeable. Floats are not scale, but are semi-scale and are the proper size. They do work! The main landing gear is bent from 1/16 diameter music wire. It should be cemented to the frame and wrapped with thread at the four bends that contact the frame. The 1/32 diameter cross wire is bent to shape and soldered to the main landing gear wire. The tail wheel wire is made from 1/16 diameter music wire and cemented and sewed to the fuselage framework. The fairing for the main gear is made from 1/8 sheet balsa. The motor mount installation shown is made from plywood. Weldwood glue is recommended for this job because it is not affected by fuel and is very strong. Cut the firewall, two sidepieces, and the top piece of the motor mount from 1/16 plywood. The front piece to the motor mount is made from 1/8 plywood. Glue these together as shown on the plans. If you are using some engine other than the Mac diesel shown, be sure to check and see that the motor mount as shown will work. If not, you will have to modify the side and top pieces of the box. Cement the firewall to the front of the basic fuselage. The cowling on the original model was made from fibreglass. This material makes an exceptionally strong and abrasion resistant cowl. A solid-balsa cowl is carved and finished to a very good polished surface. Then, a plaster mold is made. The fibreglass cowl is then made up inside the plaster mold. Advice on the exact procedure to be followed can be obtained at the same place that the glass cloth and resin can be purchased. If you don't want to tackle the fibreglass cowl, simply hollow out the solid balsa cowl to clear the engine installation and use it. The fuel tank that was used on the original model was made of celluloid cemented together with model airplane cement. This will work fine with a diesel but if you plan to use a glow-plug engine, either solder one up out of brass shim stock or buy a small commercial tank. The filler line to the tank was arranged to stick out one of the cooling air inlets in the cowl. Therefore, the only out-of-scale hole in the cowl was for the needle valve. If your engine can be made to operate without adjusting the needle valve, turn the motor over and face the needle valve down eliminating even this hole. Standard model procedures can be used for covering the model. The original was covered with Silkspan, given three coats of clear dope, two spray coats of silver, then three coats of orange-yellow dope, then the orange belly trim and numerals were added. The orange was made by mixing approximately 50/50 parts of insignia red and the yellow. Wing panels knock-off - tongues slide into center-section boxes. Rubber bands looped over wheel hubs give quick float attachment. The movable surfaces were attached with soft iron wire as hinging material. The struts are made as shown on the plans. Although the wire leading edge is somewhat heavier than usual, it saves a lot of broken struts on the field and is felt to be worthwhile. The upper ends of the struts slide into aluminum tubing sockets which are cemented to the wing at the points indicated by X's on the wing plans. The bottom of the struts hooks into a wire loop that is attached to the fuselage structure. See the strut fitting details on the plans. Add thread bracing for the tail to simulate the wire bracing of the original airplane. The windows are made from 1/32 thick plastic sheet and care should be taken not to smear them with cement when attaching them to the airplane. If you want a seaplane version, build the floats as shown on the plans. These are made of sheet balsa and must be thoroughly waterproofed. An aluminum tube will be required in the fuselage to take the aft brace wire for the pontoons. This wire is silked to the pontoons as shown on the plans. The front support block fits around the wheel hubs and is attached with rubber bands. 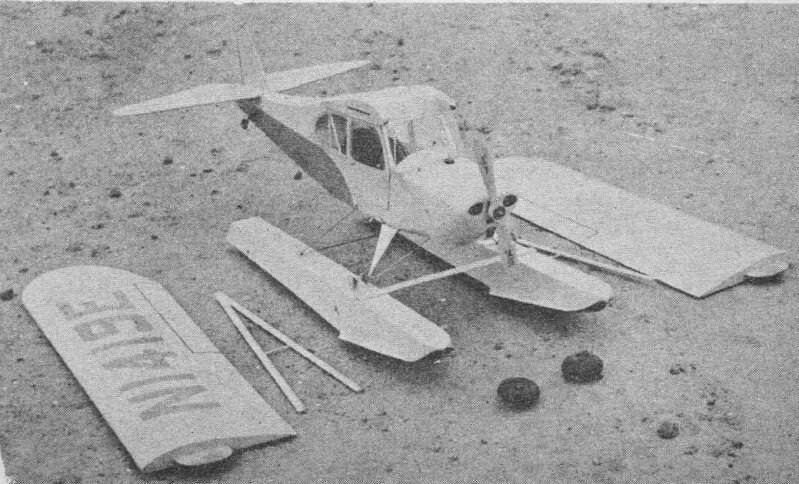 If you want to build only the seaplane version, the author would suggest one change to the model. 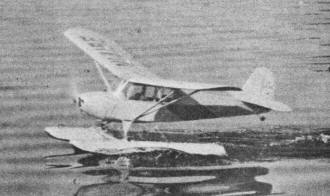 With the pontoons in place, less dihedral is required. In windy conditions, less dihedral would be helpful while on the water, to cut down on the normal overturning tendency when taxiing crosswind. A short trip to the airport will supply you super scale fans all the details that you want. And if the longerons sag on your model because the covering is too tight, take a camera along and substantiate the sag with a photograph. Almost all the real ships sag too. Make sure there are no warps in the model before you leave home. Make sure the engine runs. Try it the night before. Unless you have some good tall grass make your first flights ROG. Otherwise check the glide with some hand-launched flights. It should glide flat and fairly slow. The elevators can be used for trim. Adjust the rudder for a wide (almost straight) right turn. Now try some low power ROG flights. Any drastic turning tendency will show up before the model is airborne. If there is a turning tendency, correct it. Gradually, increase the power until the airplane climbs out. It should climb almost straight out and glide in right circles. A slight left turn under power is satisfactory.